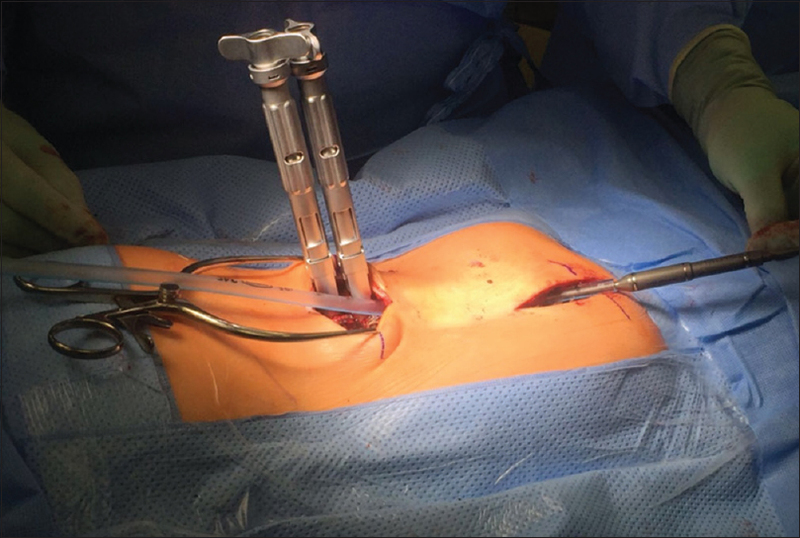 Purpose: In this study, we would like to describe a novel technique for subfascial insertion of magnetically controlled growing rods using chest drain during surgery for early-onset scoliosis. Materials and Methods: Posterior approach, surgical dissection to the spine is performed exposing the relevant anatomy to allow placement of pedicle screws always in the distal construct and pedicle screws or hooks in the proximal construct. To allow easy passage of the Magnetic Expansion Control (MAGEC) rod, as well as easy maneuvering of the rod in either the cranial to caudal direction, we use a chest drain of size 24 French diameter as a tunnel. This allows surgeons to fit the nonflexible part of MAGEC rod in the middle of the deformity and cut to length passed through the chest drain from a cranial to caudal position and then chest drain is removed. Results: A total of 40 children with early-onset scoliosis had insertion of MAGEC rods using this technique. There were 21 female and 19 male patients. Early-onset scoliosis etiology is idiopathic in 20 patients, neuromuscular in 16 patients, and others in 4 patients. Median age across all groups was 7 years (range 4–13) at the time of surgery. Follow-up ranged from 11 to 56 months with a median of 24 months. 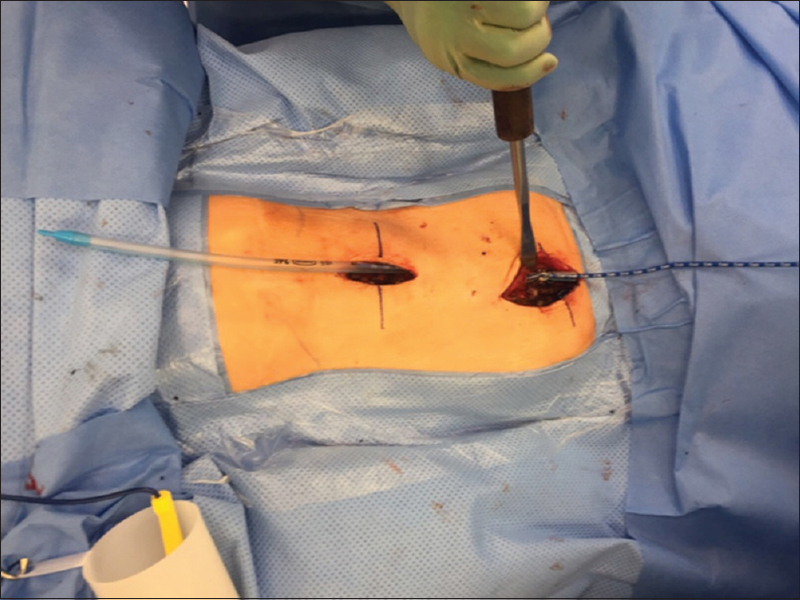 Conclusion: The use of a chest drain during subfascial passage of magnetically controlled growing rod is a safe, reliable, reproducible novel technique. This shortens overall time of surgery in our experience. Early-onset scoliosis develops in children from birth to 7 years of age. Initial management consists of serial casting and brace treatment. Surgery is required in progressive deformities in spite of serial casting or brace treatment. Growing rods were developed to prevent progression of these deformities in growing spine as well as allowing longitudinal growth of the spine. Spinal fusion in growing spine can lead to impaired pulmonary development leading to thoracic insufficiency syndrome. 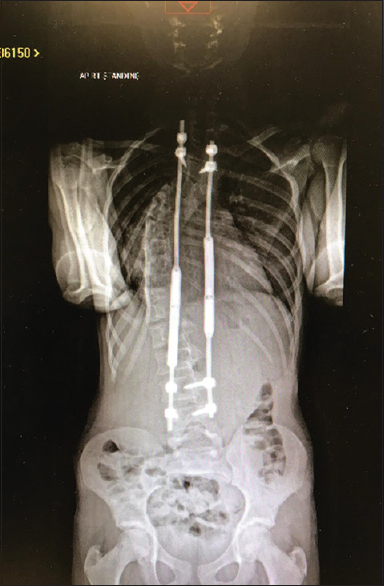 Growing rods not only allow the child to grow but also it improves the thoracic volume and prevents thoracic insufficiency syndrome while delaying the need for spinal fusion. Magnetic Expansion Control (MAGEC) rod system is been increasingly used for the management of early-onset scoliosis. 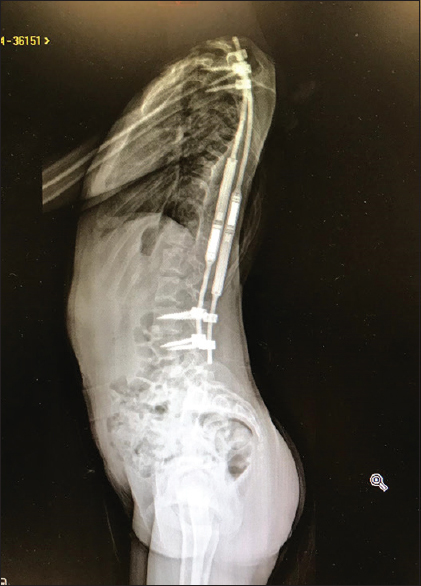 Unlike traditional growing rod systems for scoliosis, MAGEC rods can be extended in the outpatient setting and thus negate the need for general anesthesia and repeated invasive surgery. MAGEC rods are licensed for the use in patients who are <10 years of age, patients with a Cobb angle >30°, and a thoracic spine height <22 cm. All of these rods are inserted subfascially to prevent impingement on the skin. Most surgeons usually insert concave rod as it is easier to insert the rod on concave side. Cheung et al. described some tips and tricks for insertion of MAGEC rods and suggested not to bend the rigid portion of the rod and also to use standard and offset rods as direction of the distraction is cephalad and caudal, respectively. As per our knowledge, there are no studies to describe a novel technique to pass MAGEC rods subfascially using chest drain. This technique not only makes the passage of MAGEC rod easy in the subfascial plane but also allows the exact length of the rod on either end of the flexible part of the rod so that rigid part of the rod stays in the middle of the deformity. The patient is positioned prone to standard prep and drape. 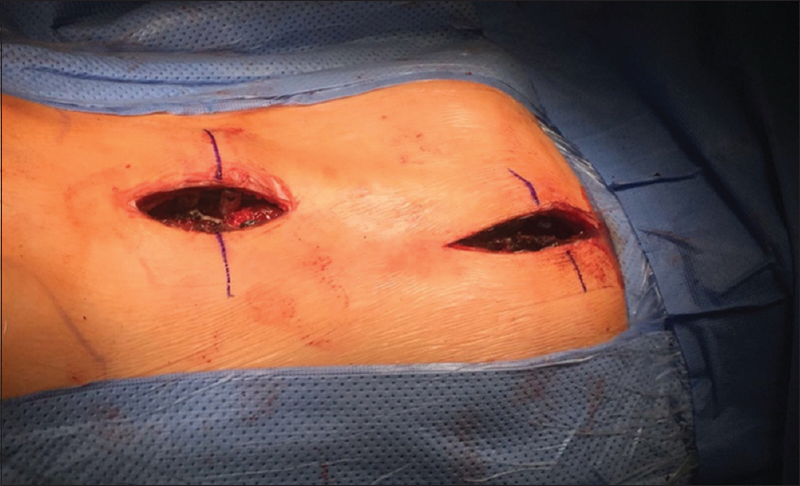 Proximal and distal anchor sites are identified and two separate skin incisions one for distal foundation and proximal foundation leaving the middle part of spine intact [Figure 1]. Posterior approach, surgical dissection to the spine is performed exposing the relevant anatomy to allow placement of pedicle screws always in the distal construct, pedicle screws, or rib hooks in the proximal construct. It is recommended that pedicle screws are used in proximal foundation if the size of the pedicles allows this if not then rib hooks should be used with standard pedicle screws in the lumbar spine. The MAGEC rods come in two lengths, 70 and 90 mm; the length of the rod that is going to be used is decided by the distance between the proximal and distal foundation. To measure this distance, a cylindrical flexible ruler is provided; however, to use this, it must be placed in the subfascial tunnel connecting the proximal and distal foundations. This can result in inaccurate readings, as it is not possible to visualize the course the ruler has taken because of the flexibility of ruler. 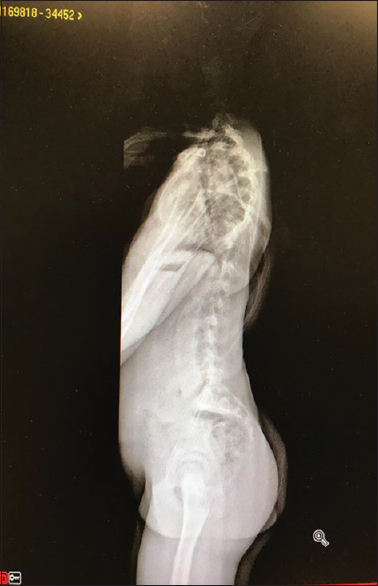 Further to this, once the ruler is removed, it is often difficult to find the tunnel which is then required for passing the MAGEC rod in the subfascial plane. As a result, further attempts to find the tunnel result in unnecessary soft-tissue trauma and creation of multiple subfascial tunnels. To combat these problems and to allow easy passage of the MAGEC rod, as well as easy maneuvering of the rod in either the cranial or caudal direction, we use a chest drain of size 24 French diameter as a tunnel. 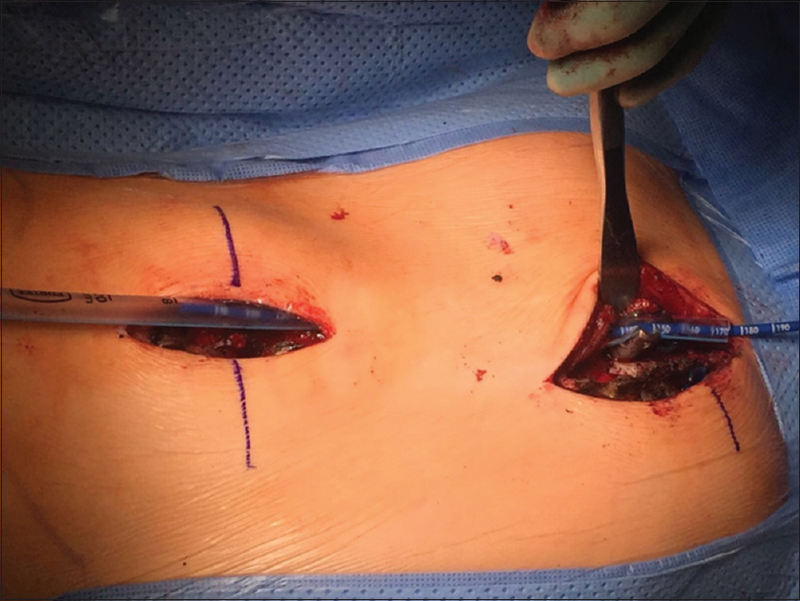 Following creation of subfascial plane, a Moynihan forceps is used to pass the chest drain through this tunnel [Figure 2]. The chest drain now remains in place and allows easy passage of flexible ruler without any kinks for the measurement of the gap between the proximal and distal foundations [Figure 3]. Once this is established, the correct-sized MAGEC rod can be selected and measurements on the flexible ruler that is within distal and proximal foundations on either side of the skin incisions were noted and drawn on the sterile table [Figure 4]. This allows surgeons to fit the nonflexible part of MAGEC rod in the middle of the deformity and cut to length and passed through the chest drain from a cranial to caudal direction [Figure 5], and then, chest drain is removed as shown in [Figure 6]. Rod is then gradually persuaded into distal and proximal tulips, and correction of deformity is done using translation, distraction, and torque tightened using top loading system. A total of 40 children with early-onset scoliosis had insertion of MAGEC rods. There were 21 female and 19 male patients. 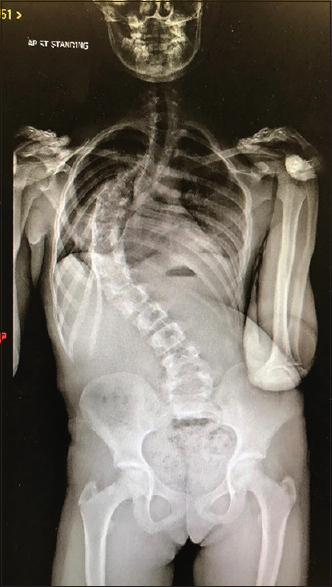 Early-onset scoliosis etiology was idiopathic in 20 patients, neuromuscular in 16 patients, and others in 4 patients. Median age across all groups was 7 years (range 4–13) at the time of surgery. Follow-up ranged from 11 to 56 months with a median length of follow-up being 24 months. A total of 76 rods were implanted to 40 patients, 36 two-rod constructs and 4 single-rod constructs using this technique. 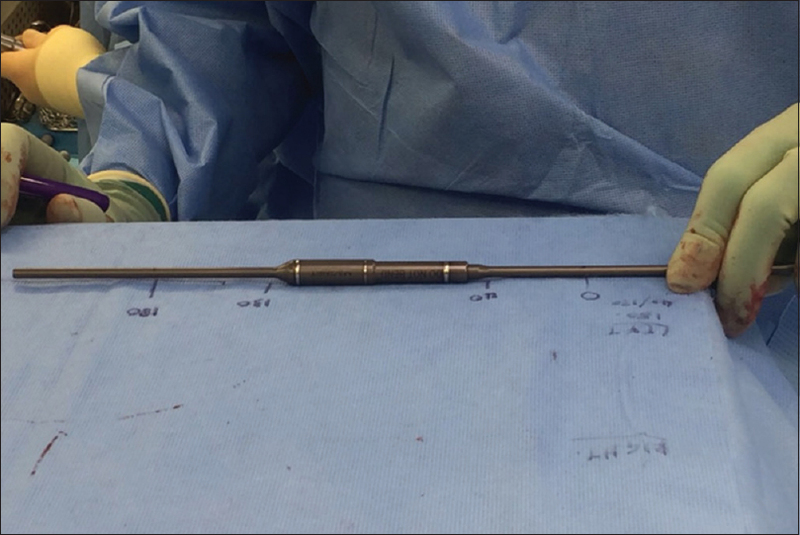 Two patients were converted from single- to dual-rod constructs during follow-up. Average preoperative Cobb angle of 68° (47–104), an average correction of 28° (10–55), and at most recent follow-up postoperative, Cobb angle was 40° (20–80). Overall, on an average, there was a 41% improvement in the Cobb angle at recent follow-up. [Figure 7] and [Figure 8] are EOS (Trade mark) images of whole-spine anteroposterior (AP) and lateral views showing large early-onset scoliosis with significant truncal shift. [Figure 9] and [Figure 10] are postoperative EOS images of whole-spine AP and lateral views showing correction of scoliosis with MAGEC rods. The most common complication was fatigue fracture of the rod. There were four fractures of rods, three occurred in single-rod constructs and one in dual-rod construct. Failure of proximal anchoring mechanism occurred in one patient which needed revision. 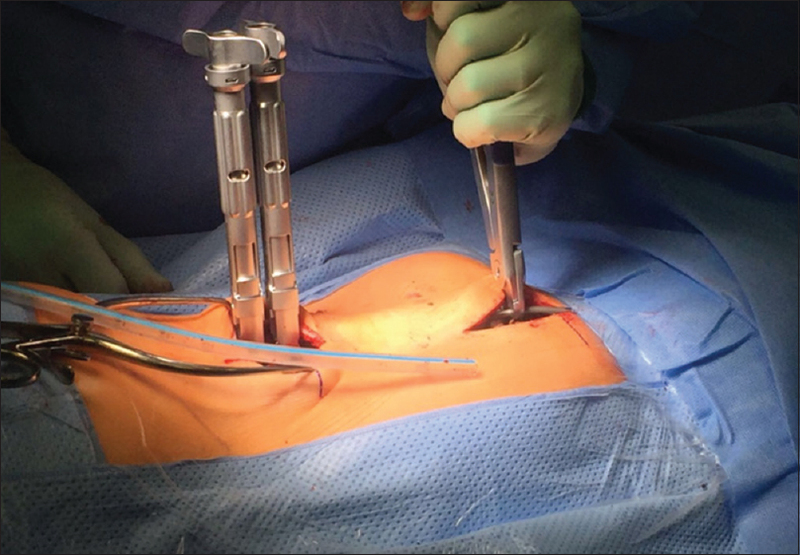 The use of a chest drain during subfascial passage of magnetically controlled growing rod is a safe, reliable, reproducible novel technique. This shortens overall time of surgery in our experience. This technique also avoids multiple subfascial tunnels which in turn prevents undue soft-tissue trauma. It is an inexpensive method of ensuring correct rod size craniocaudally is selected. Furthermore, this technique is relatively easy to learn to use in practice which makes it generalizable. Hickey BA, Towriss C, Baxter G, Yasso S, James S, Jones A, et al. Early experience of MAGEC magnetic growing rods in the treatment of early onset scoliosis. Eur Spine J 2014;23 Suppl 1:S61-5. Cheung JP, Samartzis D, Cheung KM. Focus on management of early onset scoliosis. Br Ed Soc Bone Joint Surg 2013. Available from: http://www.boneandjoint.org.uk/content/focus/management-early-onset-scoliosis. [Last accessed on 2018 Dec 01]. Jenks M, Craig J, Higgins J, Willits I, Barata T, Wood H, et al. The MAGEC system for spinal lengthening in children with scoliosis: A NICE medical technology guidance. Appl Health Econ Health Policy 2014;12:587-99. Surgical Technique Guide MAGEC Remote Control Technology for the Treatment of spine Deformities. MAGEC: Adjustable Solutions for Spine. Available from: http://www.innosurge.com/sites/default/files/uploads/surgery-techniques/Surgical%20technique_4.pdf. [Last accessed on 2018 Dec 01]. Cheung JP, Bow C, Samartzis D, Ganal-Antonio AK, Cheung KM. Clinical utility of ultrasound to prospectively monitor distraction of magnetically controlled growing rods. Spine J 2016;16:204-9.